UPDATE: January 19th, 2013 – Tacofino has changed their menu and removed the Poke Tostada. My Poke search must continue …..
One of my favourite places in the world is Oahu, Hawaii. The atmosphere, attitude, climate, and natural beauty in Oahu come together to form a perfect vacation spot (or retirement spot, fingers crossed) in my book. Whenever I go traveling I try to eat like the locals. In Oahu that means spam musubi, loco mocos, plate lunches, shrimp trucks (WE NEED THESE IN VANCOUVER!!!!! ), real shaved ice, fresh fruits (pineapples, papayas, avocados, etc) and above all else POKE BOWLS. According to Wikipedia, “Poke is a local Hawaiian cuisine that originally involved preserving raw fish with sea salt and rubbing (lomi) it with seasonings or cutting it into small pieces. Seasonings made of seaweed, kukui nut, and sea salt were traditionally used for the Hawaiian poke. Since first contact with Western and Asian cultures, scallions, chili peppers, and soy sauce have become common additions to it.” From personal experience, you can add Maui onions and avocados to that list of additional ingredients since first contact. There was a grocery store near a North Shore beach I was frequenting that was selling various types of Poke similar to grocery stores in Vancouver sell different types of prepared salads in their deli section. Pick a Poke and the staff would scoop it onto of some rice and you’ve got a Poke Bowl. If it was good enough for the locals who just finished their surfing session, it was good enough for me. I fell in love with the Poke Bowl; it was light, simple and nutritious. I also liked the fact you can could get various types that were not spicy. It was perfect for the beach as long as you ate it as soon as you got it (30 degrees heat + raw fish is not something you should let sit). I don’t know why I thought I could find Poke in Vancouver. You would think that in Vancouver, a Poke Bowl would just slot in somewhere between Japanese Chirashi or Spicy Tuna Sashimi Donburi (the kind that comes with Cucumbers) and Spicy Korean Chirashi (Hwe Dup Bap – 회덥밥). With the numerous sushi places and other eateries that serve ceviche, raw fish or tuna tataki in Vancouver, who would of thought Poke would be so hard to find? Finally a restaurant (not surprisingly with a connection to surfing) started to offer Poke! The Poke Tostada at Tacofino Commissary is the first restaurant in Vancouver I have come across to offer any that came close to non-spicy Hawaiian Poke. I was very eager to rekindle my love for Poke! My photo doesn’t do it justice but I think you can get the general idea of the Poke Tostada. 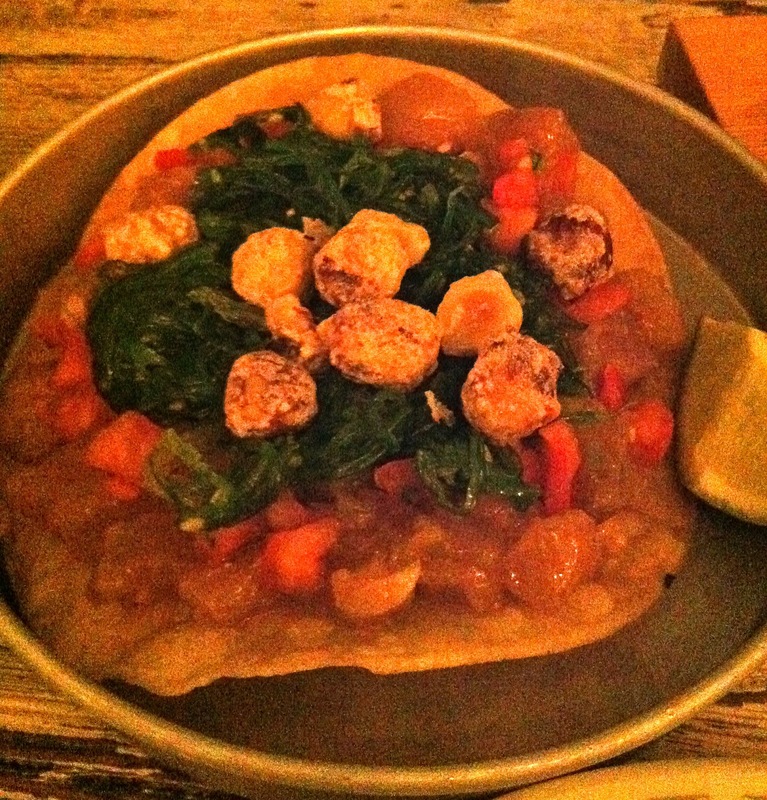 The Poke tostada consists of albacore tuna, soy, sesame, wakame, beer hazelnuts served on a crispy tostada. The soy and sesame seasoned the tuna perfectly and resembled the fish mixtures in Oahu. The wakame added texture and a sweetness to dish but I didn’t care for it as I felt it didn’t hinder or help. What did not work was the whole beer hazelnut. I ended up flicking most of them off the tostada. I think Tacofino was trying to add more texture and increase the flavour in the dish. The texture of the whole crunchy beer hazelnut was jarring. Perhaps if the hazelnut was coarsely chopped, I think it would be a more successful addition to the dish. It’s certainly not a traditional Poke, but the spot on seasoned tuna is enough to invoke happy memories of the North Shore for me. Until I return to Hawaii or I find a better Vancouver rendition, I will happily eat the Poke Tostada at Tacofino after I picked off the hazelnuts.